The refurbished Buffalo Bills hosted the New York Jets in an American Football League season-opening game on September 10, 1967. 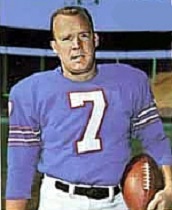 Coached by Joe Collier for the second year, the Bills had won the last three Eastern Division titles but, after advancing to consecutive league championships in 1964 and ‘65, failed to win the AFL title game in ’66, thus costing them a spot in the first Super Bowl. The team made major trades during the offseason in an effort to upgrade at key positions. QB Tom Flores and split end Art Powell were obtained from Oakland and HB Keith Lincoln from San Diego. 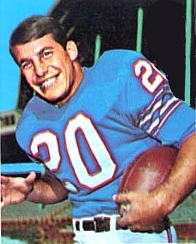 All three were highly regarded veterans and Flores moved ahead of QB Jack Kemp (pictured above), who had been behind center during the previous successful seasons. The Bills even had a new placekicker in Mike Mercer, an experienced hand who performed ably for the Chiefs in 1966. New York, entering the fifth year under Head Coach Weeb Ewbank, was coming off of a 6-6-2 record in ’66, which was a step up from four consecutive five-win seasons. Talented QB Joe Namath had a strong arm and quick release that could yield big gains through the air but also gave up many interceptions. There were outstanding receivers in flanker Don Maynard and split end George Sauer, and an effective running tandem in FB Matt Snell and HB Emerson Boozer. However, the defense had been a sore spot and would need to improve if the club was to rise further in the standings. There were 45,478 fans in attendance at War Memorial Stadium and they saw both teams miss scoring opportunities in the first quarter. Mike Mercer attempted a 46-yard field goal for the Bills that was blocked by DB Cornell Gordon and New York’s Jim Turner was wide to the left on a 16-yard field goal try. During the second quarter, the Jets put together a 10-play, 57-yard series that was helped along by a pass interference penalty on LB John Tracey. Three plays later, Joe Namath threw to Don Maynard, who outmaneuvered CB Booker Edgerson for a 19-yard touchdown. Turner added the extra point. Buffalo responded with a promising possession, but after Keith Lincoln (pictured at left) ran for 23 yards to the New York 35, a holding penalty and two sacks moved the Bills back. On the next series, the Jets took just five plays to advance 71 yards. Namath again connected with Maynard, this time for a 56-yard TD with 21 seconds left in the first half. Turner’s conversion staked New York to a 14-0 lead at halftime. The Bills were unable to put together sustained drives with Flores behind center and a twisted knee suffered late in the second quarter forced him to the bench. Jack Kemp took his place in the second half, although the results were not immediately different. 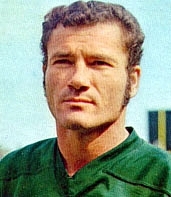 One of his passes was intercepted by safety Jim Hudson, and the result was that the Jets increased their lead less than five minutes into the third quarter when Turner kicked a 32-yard field goal. The home team continued to struggle on offense and another New York interception, this time by Cornell Gordon, who was injured on the play, nearly led to another score but Turner missed a field goal attempt from 40 yards. Down 17-0 after three quarters, the Bills came to life early in the final period. They advanced 46 yards in five plays, although it nearly was for naught when Lincoln fell while running a pass route and Solomon Brannan, the replacement for Gordon, dropped a potential interception. On the next play, Kemp passed to Art Powell for a 24-yard touchdown and Mercer added the point after. The Jets had to punt following their next possession and Curley Johnson’s 29-yard kick was returned seven yards by CB Butch Byrd to the New York 37. On the next play Kemp threw long to Powell in the end zone for another TD. Mercer’s conversion narrowed the tally to 17-14 with 4:39 on the clock. New York fought back as Namath completed two passes and a personal foul penalty again moved the visitors into scoring territory. However, Turner once again failed on an attempted field goal, this time from 35 yards. The Bills were forced to punt but Paul Maguire’s kick traveled 50 yards and was downed at the New York one yard line. The Jets had to punt in turn, and while three plays by Buffalo gained nothing, Mercer kicked a 51-yard field goal (a new club record at the time) to tie the score with 2:27 remaining to play. Another series by the Jets resulted in a punt and the Bills had the ball at their 18 with 1:20 to go. Kemp tossed a swing pass to Lincoln that gained 24 yards and then threw to TE Paul Costa, who made a leaping catch for 21 yards. With the clock down to four seconds, Mercer booted a 43-yard field goal and Buffalo won by a final score of 20-17. New York had the edge in total yards (287 to 248) although the Bills led in first downs (15 to 14). Buffalo also suffered the only two turnovers of the game and sustained four sacks by the Jets while recording two of its own. However, while Mike Mercer (pictured at right) kicked the two big field goals for Buffalo, Jim Turner missed on three of his four attempts. Jack Kemp completed 12 of 23 passes for 167 yards and two touchdowns while giving up two interceptions in relief of Tom Flores, who was 6 of 11 for 40 yards and no TDs (or interceptions) in the first half. Keith Lincoln rushed for 81 yards on 13 carries and netted another 23 yards on three pass receptions. Flanker Elbert Dubenion caught 6 passes for 54 yards while Art Powell gained 91 yards on his 5 receptions that included the two touchdowns. For the Jets, Joe Namath was successful on 11 of 23 throws for 153 yards and two TDs while having none picked off. 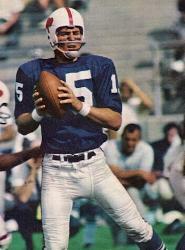 Don Maynard caught 5 of those passes for 106 yards and two touchdowns. Matt Snell topped the rushers with 95 yards on 19 attempts and Emerson Boozer contributed 53 yards on his 16 carries. While Buffalo fans might have felt optimistic following the come-from-behind win, particularly with newcomers Art Powell, Keith Lincoln, and Mike Mercer having starring roles (if not Tom Flores), the season went downhill from there. The Bills lost their next three games on their way to a 4-10 record that tied with Miami for third place in the Eastern Division that they had previously dominated. While Lincoln and Mercer performed well, Powell lasted for six games before going out with a knee injury that required surgery and Flores, suffering from a sore arm, completed only 34.4 percent of his 64 passes and threw for no touchdowns while giving up eight interceptions, thus being relegated to the bench. Adding insult to injury, QB Daryle Lamonica, the backup who was sent to Oakland in the deal for Flores and Powell, had a MVP season as the Raiders won the AFL Championship. The Jets went 5-0-1 over the next six weeks and appeared to be the successors to the Bills, who they defeated in the rematch at New York, until a late-season collapse caused them to finish second to Houston with an 8-5-1 tally. Joe Namath passed for a record 4007 yards but threw for more interceptions (28) than touchdowns (26). Don Maynard (pictured at left) caught 71 passes, second only to teammate George Sauer, for a league-leading 1434 yards and 10 TDs.